The easiest way to tell a StuG III from a Stug IV is to count them number of road wheels. 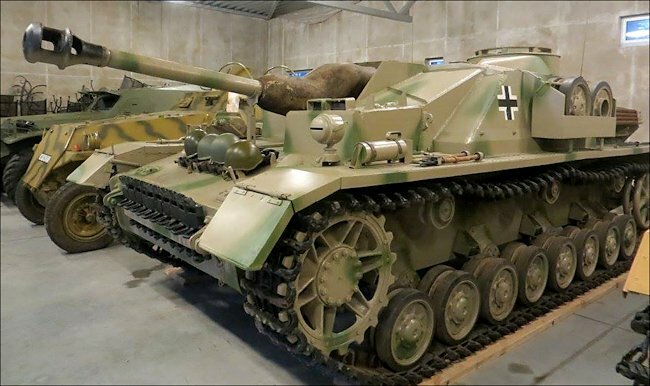 A Stug III has six road wheels and a StuG IV has eight as it has a longer chassis and is based on the Panzer IV tank and not the shorter Panzer III. Normally the Panzer IV tank has 4 Returnroller on the upper section of the track but both 3 and 4 returnroller-versions were produced side by side, starting in December 1944. The StuG IV used the Panzer IV Ausf. J chassis. Every change done to the Ausf J also appeared on the Stug. IV. The StuG IV tank destroyer was armed with a 7.5 cm StuK 40 L/48 gun. A 7.92 mm Maschinengewwhr 34 Machine gun was mounted on the top of the hull. The four man crew, commander, driver, gunner and loader, were protected by armour that ranged in thickness from 10 mm to 80 mm. It was powered by a V12-Cylinder Maybach HL 120 TRM petrol engine that produced 296 hp. It had a top road speed of 40 km/h (25 mph). It had an operational range of 210 km (130 miles). It weighed 23 tonnes (50,705 lbs). They were produced from late 1943 to the end of the war in 1945. 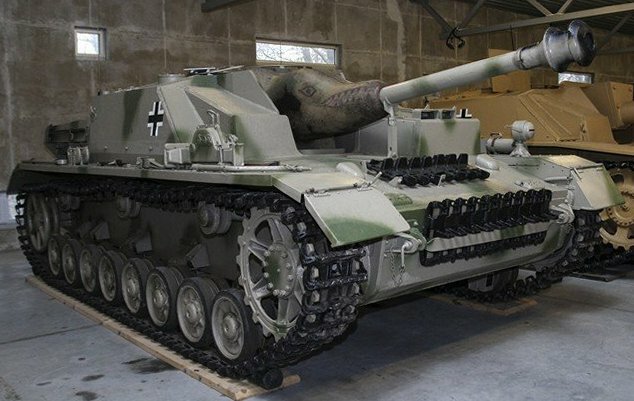 In October 2011 a Sturmgeschütz IV was discovered in a swamp in the World War Two battlezone called the Courland Pocket. It was recovered, cleaned, preserved and then offered for sale. The owners of the Sventes Muiža Hotel's Military Vehicle Museum aquired it for their collection. The Courland Pocket, known to the Germans as the Kurland-Kessel, refers to the Red Army's blockade or the encirclement of Axis forces on the Courland Peninsula during the closing months of World War II. 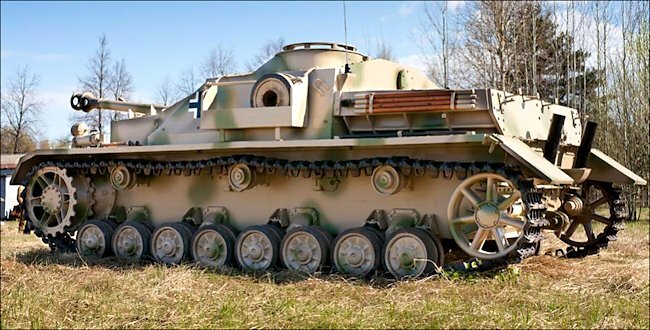 This Sturmgeschütz IV tank destroyer only has three top track return rollers. Some had four. Both versions were built at the same time. Where can I see more StuG IV Tank Destroyers?